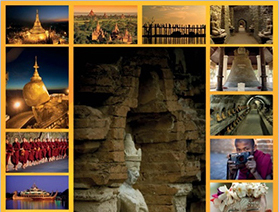 Whether for a short trip or a long in-depth holiday, Myanmar Shalom can create an itinerary suited to fit your needs and is sure to create a lifetime of memories. A land of golden pagodas, ancient capitals, traditional arts and crafts, diversity and a warm friendly people, Myanmar offers a richly rewarding travel experience. Tour programs below are simply a suggested and can easily be customized to suit your preferences, schedule, budget, and interests.